Use the stability ball to increase the flexibility of your hip flexors. With only a stability ball or piece of resistance tubing, you nearly have all the tools to get a killer flexibility workout. The only extra things you’ll need are a bit of floor space and some time. 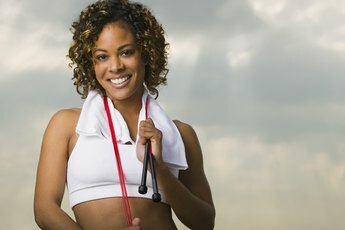 When doing flexibility exercises, warm up for five to 10 minutes with some light cardio such as jogging or jumping jacks to break a light sweat and increase the temperature of your muscles. Flexibility refers to your joint’s range of motion and your muscle’s length. When it comes to your body, being flexible does more than help you touch your toes; it helps you avoid injuries and reduce soreness and tightness following a workout. Additionally, having an increased range of motion and muscle length improves your overall mobility and helps align your body properly. 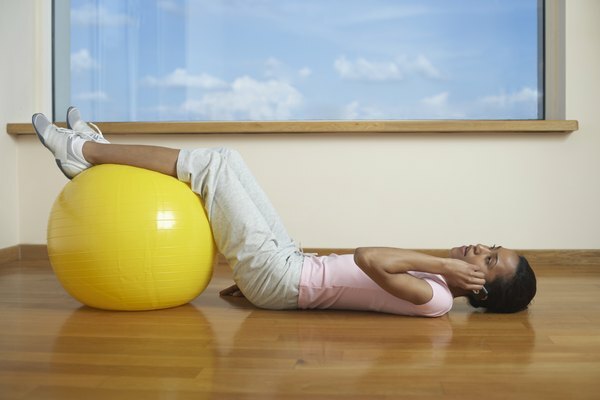 Tucked away in the corner of your gym of bedroom may be one of the most versatile workout tools -- the stability ball. With this piece of equipment, you can improve your flexibility, balance, coordination and core strength. To increase the flexibility in the front of your body, start in a deep squat with the ball against your back. Reach your arms overhead as you stand up. Let the ball roll along your spine as your back forms an arch. Hold for one second and return to the starting position. Repeat five times. To increase the flexibility of your hip flexors, quadriceps, hamstrings and lower back, lie on the floor on your back with your knees bent and feet resting on the top of the ball. Press your heels into the ball and lift your hips up until you body is in a straight line from your head to feet. Keep one foot balanced on the ball while bringing the opposite knee toward your chest. Hold for one second and then repeat with the other leg. Return to the starting position. Repeat five times. Tubing equipment mainly increases strength and stability through resistance training. The basic tubing style features a long tube with handles. When selecting one, choose one that is easy to use and achieves resistance early in the stretch. Generally, lighter tubing has less resistance. To garner the greatest flexibility benefits with a tube, you must perform exercises that put your joints through a full range of motion. Do this by changing your position to work your joint in different directions. Examples of tubing exercises include chest presses, bicep curls, squats and seated rows. When it comes to increasing flexibility, a stability ball is a better option than a tubing band. This is because tubing bands strengthen your muscles while a ball allows you to stretch your muscles without loading them. If you use tubing bands for a strengthening workout, including static and dynamic stretches between sets and at the end of your tubing workout to further enhance muscle flexibility.